When you want to strengthen something or focus one area, a close-up shot can help you achieve that. Below are some helpful approaches. If you're aiming for high-quality macro shots, then consider investing in a dedicated macro lens. Almost all manufacturers of DSLR cameras offer a variety of lenses, including macros ranging from short (30mm to 60mm) to medium (60mm to 105mm) to tele macro (105mm to 200mm). However, for regular close-ups, zoom lenses like a 55mm to 200mm or a 70mm to 300mm lens will work well. Even a fixed 50mm lens with an f/1.8 aperture can produce some nice close-ups. Certain point-and-shoot cameras or DLSRs let you switch into macro mode simply by turning the dial to a macro setting (usually a tulip symbol). This allows you to focus at a very short distance from the subject. The quality of this macro setting, however, is very different from the quality you get when you use a dedicated macro lens. A camera's macro setting will not shoot a subject so that it appears greater than life-size. For a great close-up, isolate your subject from its background by using a shallow depth of field (set the aperture to a low number) and/or picking a nondistracting background, if possible. Focus carefully and pick a specific focus point so your subject comes out looking sharp against a softer background. If you use a camera or lens with autofocus, make sure the lens is focusing on the object you want. Without a macro lens, you may have trouble focusing precisely, but you can remedy this by moving the camera a bit farther away from the subject. 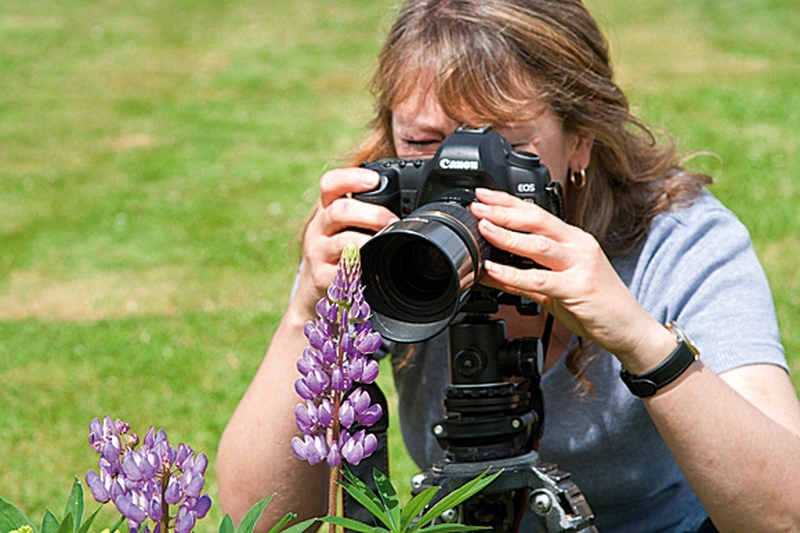 If you are using a zoom lens, then move back and zoom into your subject. A common problem with close-ups is that if your light source is behind the camera, it will cast a shadow over the subject. Fix this problem by using a flash or other off-camera lighting. An off-camera flash will help avoid flattening the image and creating a shadow cast by the illumination. In the image on the left, a shadow is cast over the subject. In the image on the right, I took the strobe off the camera to eliminate the shadow from the camera. However, there is still an on-camera flash causing the slight shadow in the background. Another common problem with close-up photography is image blur. The most common cause of image blur is the lens’s inability to focus at such a close proximity to the subject. To prevent that, first switch your camera to the macro setting (if it has one) and try again. If that fails, move the camera a little further away from the subject, or if you're using a zoom lens, back up and zoom into the subject. Image blur can also be caused by slow shutter speed, low light, or a moving subject. To prevent this kind of blurring, set your camera up on a tripod or raise your shutter speed.